Weekly Spins Report | by Paul Ziino – WELCOME TO OUR INTERNATIONAL SUPPORT! Do you need to see what your top 40 songs were last week? There is a quick way to do this using the History Browser in MusicMaster. Either go to Dataset/Analysis/History Browser, or click the History Browser icon in the Toolbar. The first tab on your History Browser Options box is “Time Period”. Here you select the first and last hour you wish to include in the report. You can also use the default setting of Last Complete Week which uses the Broadcast Week settings in Tools/Options to determine what is considered a week in your database and produces a report based on it. If you wish to exclude hours from the week, use the space bar to clear the green dot from those hours in the “Included Hours” grid. Next you’ll go to the “Categories” tab. Here you’ll check only the categories you wish to include in your spins report. 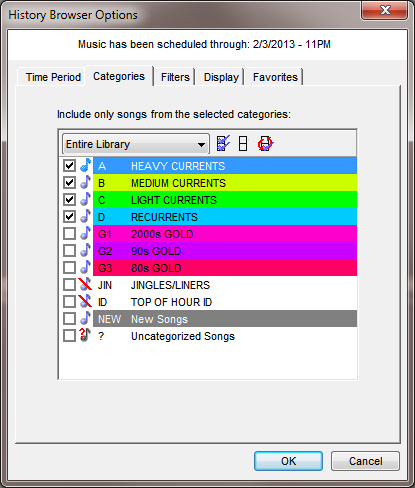 Remember, if you’ve moved songs to new categories since scheduling the week in question, you’ll want to check the categories of where those songs currently reside in order to include them in your report. 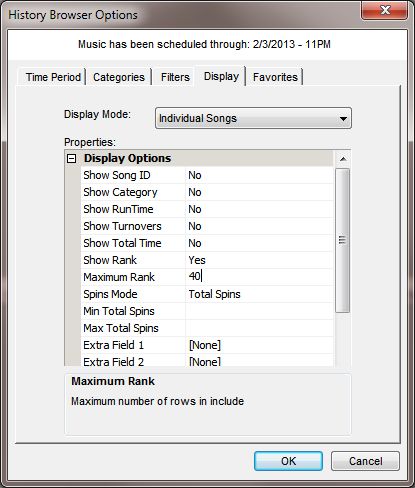 Generally for your weekly spins report you will not need to enter anything on the “Filters” tab. But if you wanted to only include songs by a certain artist you could filter for that artist, or you could exclude a specific artist or attribute, etc. Next is the “Display” tab. Change the Display Mode to “Individual Songs”. Depending on what you’d like to see in your report, you can toggle the Song ID, Category, RunTime, Turnovers, Total Time, and Rank between inclusion and exclusion. 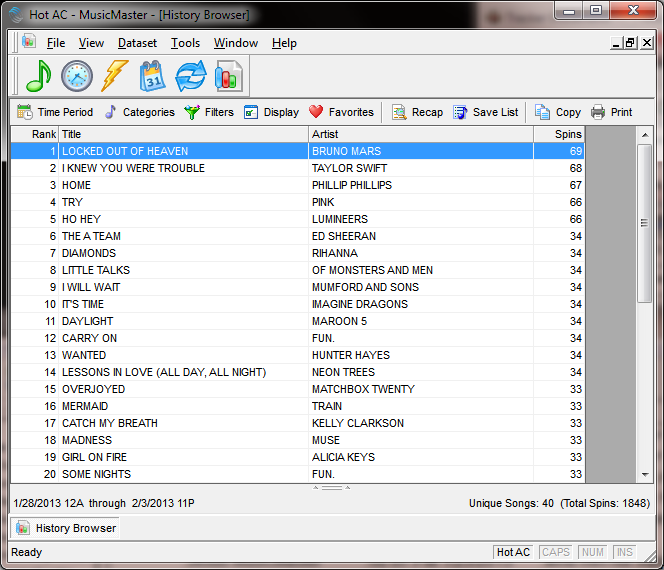 If you just want the top 40 songs, set that as your Maximum Rank. Now you may click OK and your report will be generated. You can now print this report via that icon. Or if you’d prefer to copy it, click that icon, then paste the contents of the report to Excel, Word, an email, or wherever you like. You can click the “Favorites” icon to save the report layout as a favorite. Next time you need to run your report, select the Favorite design and click OK. Then adjust your dates and you’re all set! You can also run a Generic Spins Report via Dataset/Analysis/Special History Reports. You can learn about how to run Special History Reports here. 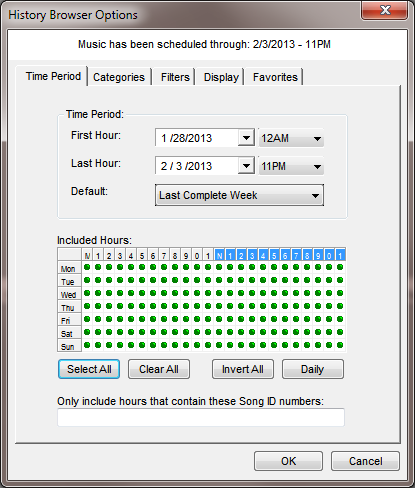 Using the History Browser in MusicMaster you can run history reports based on many fields in the database. Just remember to adjust the Display Mode on your Display tab to see all the options available.